Got a few comments on the LockedUSB post from a few days ago from the project’s creator. Had a little back and forth, and decided to republish it here. Sir thank you for your article, I think I can answer some of your questions. The Device cannot drive “way” more than it’s capacity, LockedUSB have dynamic current limits and it is not done “Magically”. And Of course we thought about it. LockedUSB don’t take away the USB handshake, it just replace it with a dedicated controller ship in between to allow safe charging without any data communication. While the Data lines are completely isolated, we still drive the voltages on both side to request and provide the adequate power. LockedUSB is also Surge and overcurrent protected, if a Surge or Overcurrent event happen, the device will shut down until it is disconnected and connected again, this keep the device from heating up and causing any fires. (or damages to the host). If you have any more question, please let me know. I’m glad to hear that your handshake is more sophisticated than your Kickstarter description made clear, but I still have some concerns. If you can negotiate for a higher current draw from a device and draw that, that’s fine. I’m more concerned about the devices you can’t negotiate with i.e. dumb USB chargers. You say: “If the host is a dedicated charger, we switch the limit to 2A.”, but not all dedicated USB chargers can supply 2A especially older ones made before smartphones were as power hungry as they are today (or just really crummy ones made today). These might depend on the phone to limit its current draw. You also mention overcurrent and surge protection which is great except for the fact that the LockedUSB is downstream from its power source. 2.1A might not seem like an overcurrent condition to LockedUSB, but it can absolutely be an overcurrent condition for the device you’re connected to if it’s an older charger. Your device appears to work in the places you have tested it, but the only way to guarantee safe functionality and compatibility is to follow the USB spec or another protocol such as Apple’s USB power protocol. What I’m hearing from your description is that your device draws as much power as it can get away with while blatantly disregarding the safeguards put in place by the USB spec. That is 100% correct. however, we account for that, the way you had described it, Older chargers don’t follow the USB charging standards 1.2, they offer a very specific signature on the data line, when we see that, we keep the current limit to 1A. We only switch to 2A when the source tell us that it is a high power source. otherwise we stay at 1A. Also, you are NOT correct when you say that LockedUSB is “downstream from its power source”. While we seen to be, we do not allow power transfers until this negotiation had taken placed. We also measure the current at the load, not a the source, so there is not way we cannot detect a overcurrect or surge. Also incorrect, and I am sorry that the description is not clear to you, LockedUSB provide as much power as is available from the source. it doesn’t disregard the safeguards of the USB standard, and it also had build in safefails in case something goes wrong. I’m glad to hear you say that you limit the current level to what the charger is rated to deliver, but you have a video demonstrating you drawing 1.2A from the USB port of a computer when the USB spec limits all devices to 500mA. This is why many external hard drives require dual USB connections to operate. The exceptions to this rule are for specific protocols such as Apple’s listed above, but that would only work for a specific subset of devices and laptops. Considering you have not explained how this is made possible, I have to assume that you are drawing more than the 500mA agreed upon per the USB specification. You are disregarding the specification and drawing more power than you should be. Either that, or your demonstration is misleading your backers and promising features that you do not plan to deliver. Also, your mention of the current protection is irrelevant. 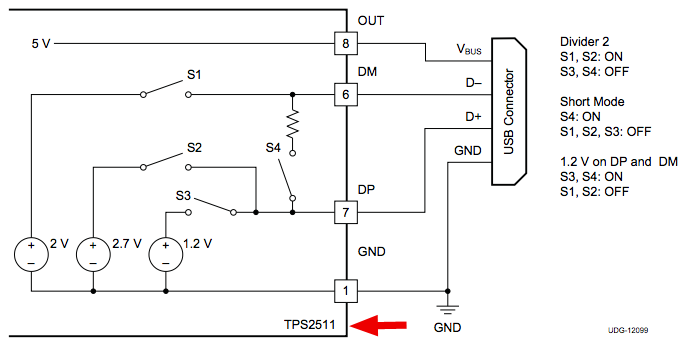 The entire purpose of over-current protection such as that provided by the TPS2511 that you’re using is to prevent damage to the *charger* during an overcurrent event such as a short circuit on the output. This protection will limit the amount of current that the LockedUSB provides to the phone (measuring current at the load as you put it), but it has no way of knowing if it is drawing a safe amount of current from the charger it’s connected to. You are counting on that charger to have its own integrated output protection which may not be the case. Some cheaper chargers may count on the phone to limit its own current consumption. If this device doesn’t break any protocols, it shouldn’t allow charging any faster than a typical USB cable, and if it does, it can possibly present a safety hazard. I’m not sure why yout think so, but at any point i had said that the current is “irrelevant”, I said we measure at the load so we can have an accurate reading of the real value. The demo was made with a prototype before all the current limits were in place, I made that clear on the campaign and with my updates. I said that the new design was supporting all the new dynamic currents switching, the prototype on the demo video was made before the campaign was posted. I am NOT using the TPS2511, just for the record, that was indicated by a backers that cancelled his pledge and I told him were were not suing that chip. You are correct, “cheaper” charger wit poor design may malfunction, but that is the case even if you use the charger without LockedUSB. Cheaper chargers can damage your device, not the Adapter. LockedUSB was not design to protect you from cheaper or missdesign chargers. LockedUSB was design for Public charger stations and USB port that comply with the charging standards. This is a real life demonstration of how LockedUSB Adapter can optimize your power and drastically reduce your charging time. In the demo, you see currents up to 1.2 Amps, the final version of LockedUSB adapter will be current limited to 1 Amp to guarantee the safety of the source. Okay, so at least they’re guaranteeing some kind of protection. Unfortunately, 1A is still twice what they should be allowed to pull from a USB port. This is even more concerning. If the LockedUSB is supposed to be smart enough to present multiple charge profiles to a device, shouldn’t it be trivial to add an indicator LED showing the current charge profile without measuring the current? After reading through the comments from the project creator, I think I see what they’re getting at. The device does do some level of negotiation for current draw and in addition to relaying this message to the device under charge, it also monitors that current to make sure the device doesn’t decide to draw too much. This is great if it’s really what they’re doing. At first I was concerned that their device might be limiting the current but limiting it to something greater than what the charger can handle. In my defense, their description does say “Surge protection up to 2.3 Amps ” which is more than most chargers can output. When you connect your device to a computer USB port, it default to the available power at that port, usually between 300mA and 500mA for USB 2.0, LockedUSB enable faster charging on this cases (computers USB ports), requesting the maximum power from that USB, potentially delivering around 1Amp, and reducing your charging time. You know what else isn’t recommended? Drawing 1A from a USB port! So in conclusion, they are addressing the critical concerns I brought up in my post, and it’s good to hear that they’re at least aware of what the issues are. I’m still not 100% comfortable with their handling of the problems though. 1A is not an entirely safe amount of power to draw out of a USB port. However, if you are careful to use the LockedUSB only in the way it’s intended to be used (in high-current public dedicated chargers), I see no reason why it won’t perform well and allow you to charge your phone safely and securely. This entry was posted on Friday, September 20th, 2013 at 10:12 pm by ch00f	and is filed under Kickstarter Campaigns. You can follow any comments to this entry through the RSS 2.0 feed. You can leave a comment, or trackback. For people that have simpler tastes, the Beverly Laurel, situated in L.
but even your dog that manages to be away from dirt and mud will. A dog with consistently alkaline urine could also present with kidney stones. And, also during that tim there is less rush andd you can make wise selection of dresses. appropriate. You also wilol be disappointed too some extent if bbuying a fashion style just because it looks good on other people. it would always be out of their price range. lot faster then most. Can you suggest a good internet hosting provider at a fair price?